12/1949 December 1949. A guy my grandfather worked with was in the Navy Seabees during World War 2. Then after the war, he was in the Seabee reserve unit. This guy kept after my grandfather to go out to the reserve unit to do their typing. My grandfather did not want to do it but they guy kept after him and my grandfather finally agreed if they paid him the same grade as he had in the Army he would do it. 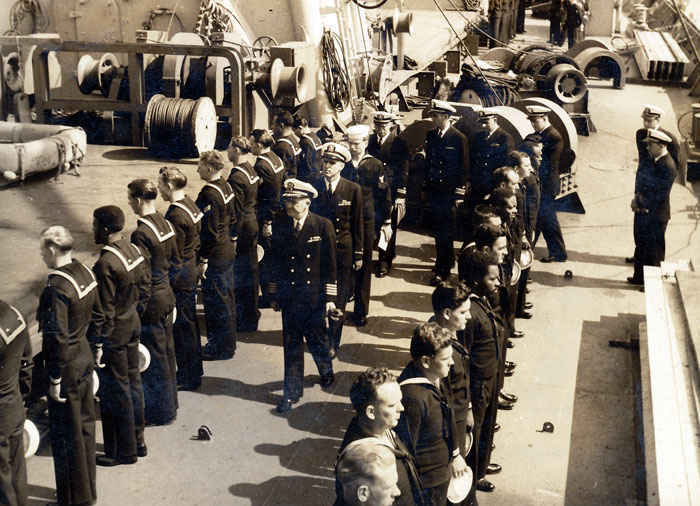 Very surprisingly, the Naval Reserve agreed to give him a Petty Officer First Class rate and he started to work. Then in June of 1950, the Korean War broke out and he was subsequently called on November 27th of 1950. Since he had a yeoman rate, they could put him anywhere in the Navy while the regular Navy man were not called. 11/27/1950 My grandfather was sent to Great Lakes, Illinois for about a month then to Treasure Island, San Francisco. He then had to report to the ship in Port Chicago. 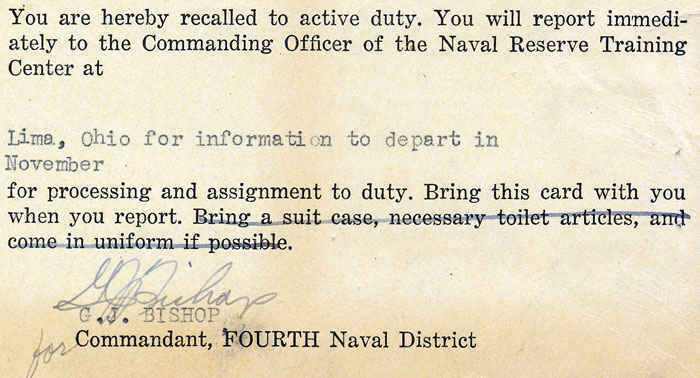 When boarding the ship, a Navy man asked my grandfather if he had a parachute. My grandfather said he did not know he needed a parachute. The Navy man said he was boarding an ammunition ship so then he knew. One week after boarding the USS Leo set sail. 12/1950 My grandfather had just been married a few months before he was called. They had a house in Lima, Ohio and he rented it out to a regular Navy Chief and my grandmother went back to live with her parents. Two years later, when he came home they were still in his home since the regular Navy was not called up. 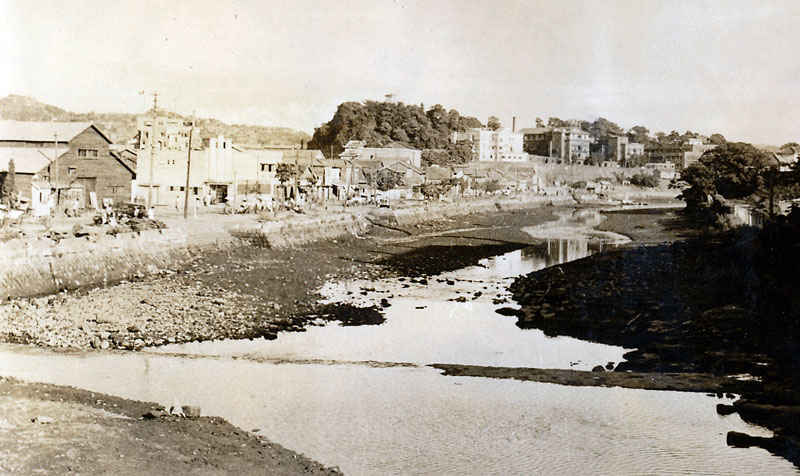 1/1951 My grandfather was only in San Francisco for two weeks before heading straight to Pohang, Korea. 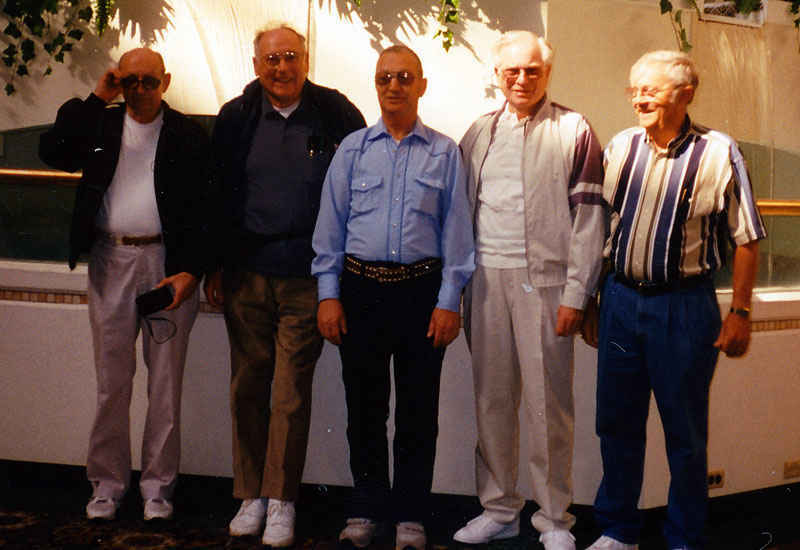 His crew of the USS Leo serviced the 7th fleet from Sasebo, Japan off the coast of Korea for 13 months. Some ships included the Essex, Boxer, Antietam, Bataan, St. Paul , a lot of Destroyer’s, Cruiser, Battleships (“battlewagons”), and Aircraft Carriers. 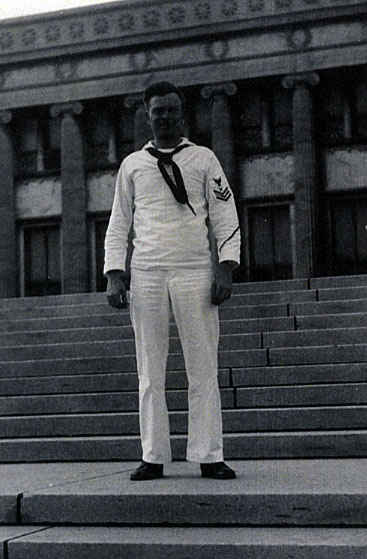 2/1951 When my grandfather arrived on the ship he did not know anything about the Navy but he was assigned to be in charge of the ship’s office because of his rank. Luckily, for him a 3rd class Petty Officer (Earl Kelly) of the regular Navy took him in and showed him everything he needed to know. 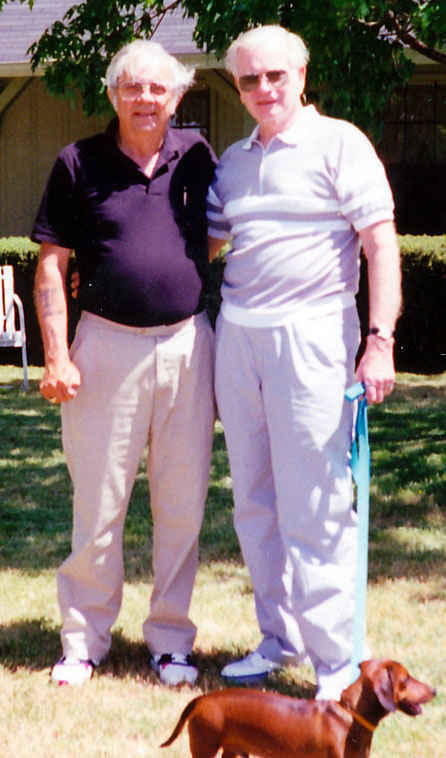 They became great friends and continued to communicate for decades later. Since my grandfather was in an Army office, my grandfather picked it up pretty fast. 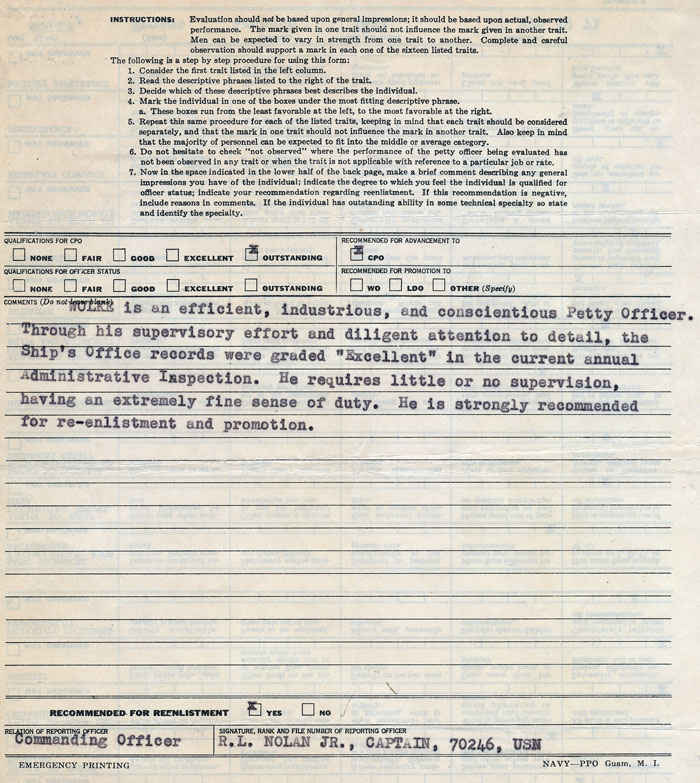 Some of his duties included following the Captain around for inspections and write up the report. They would have to put out a paper everyday on what the schedule was for the crew hour by hour. 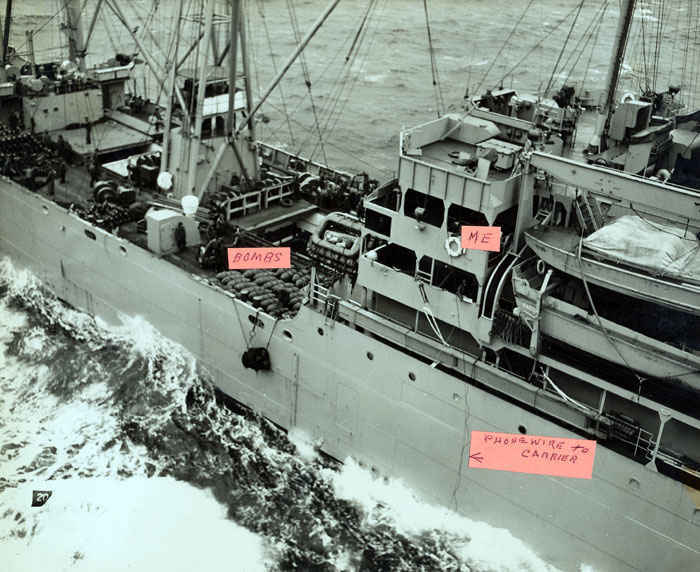 3/1951 One time a destroyer came to close to the USS Leo and took a big check out of the haul but luckily, it was above the water line. The destroyer’s captain was Admiral Nimitz’s son. 3/1951 Western Union telegrams could be sent home but one really could not say what one wanted to say. There were predefined phrases, one would pick a number, and that is what one would say. 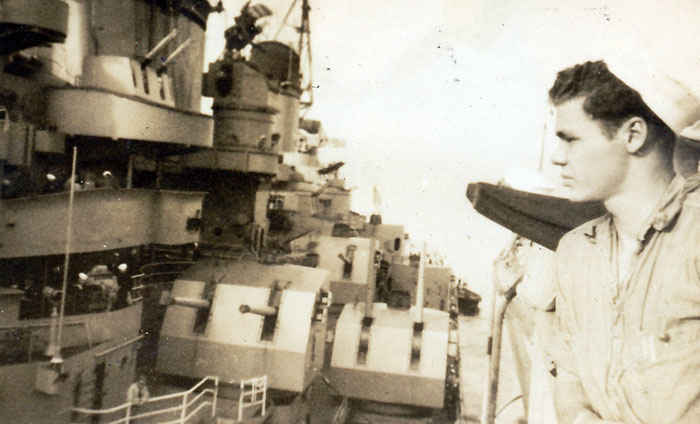 3/1951 All ammunition loading would be done at sea while underway at 5 knots. An aircraft carrier would pull up and they would shoot lines across the ship that carry the phones and cargo nets used for transportation. At the same time, a destroyer would pull up on the other side. Typically, the Leo would be at sea for 10 days unloading ammunition come back to Sasebo and take 10 days to reloading while a sister ammunition ship was doing the opposite. Japanese would reload the ship. 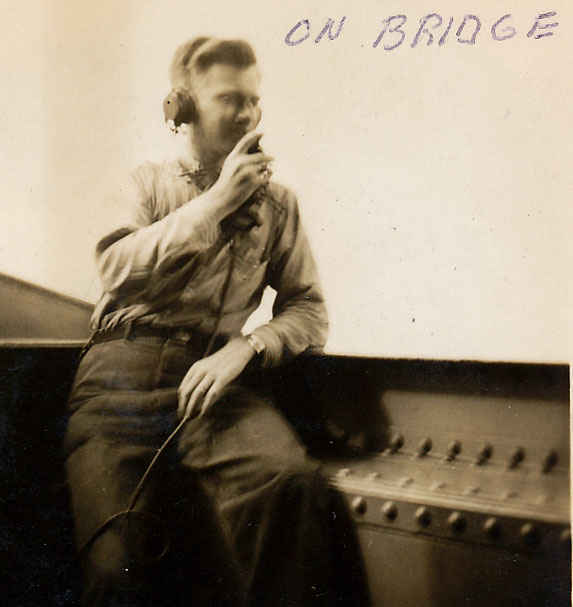 3/1951 My grandfather’s position was known as the Captain’s Talker on the bridge. He was often on the phone sending the Captain’s order’s to everyone. 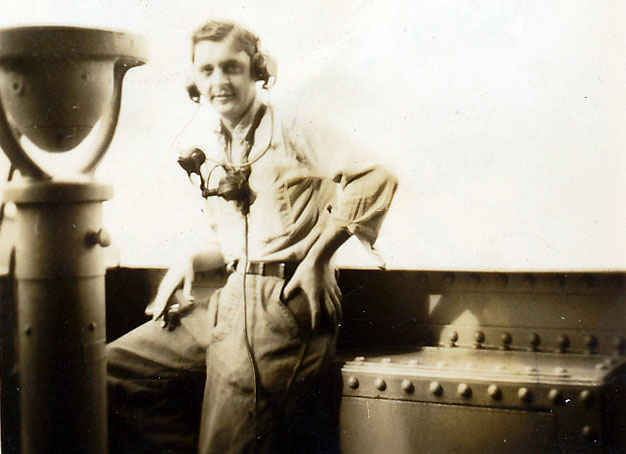 If the Captain wanted to talk to another ship or a part of the Leo, he would have to go through my grandfather. 3/1951 The biggest danger to the USS Leo was mines but luckily, the USS Leo avoided all of them. 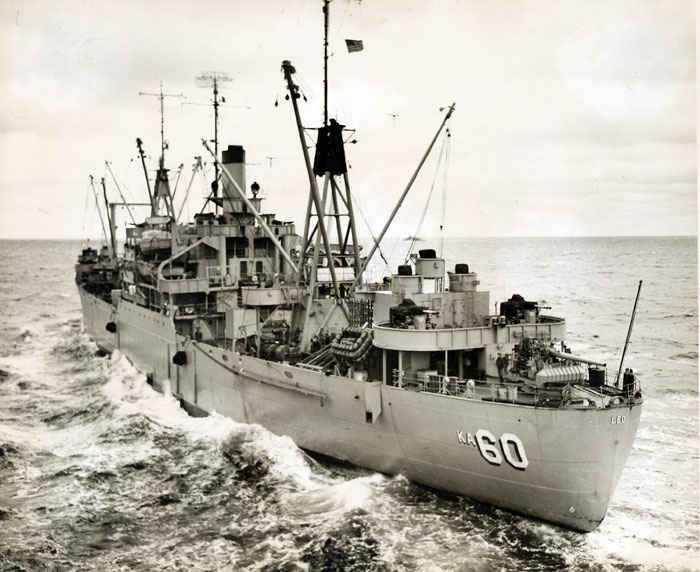 The Leo had a smaller ship called a minesweeper, which always patrolled in front of it clearing the mines. 3/1951 In the Army during World War II letters could not be sealed so that everything could be censored but in the Navy during the Korean War, they did not censor any letters. 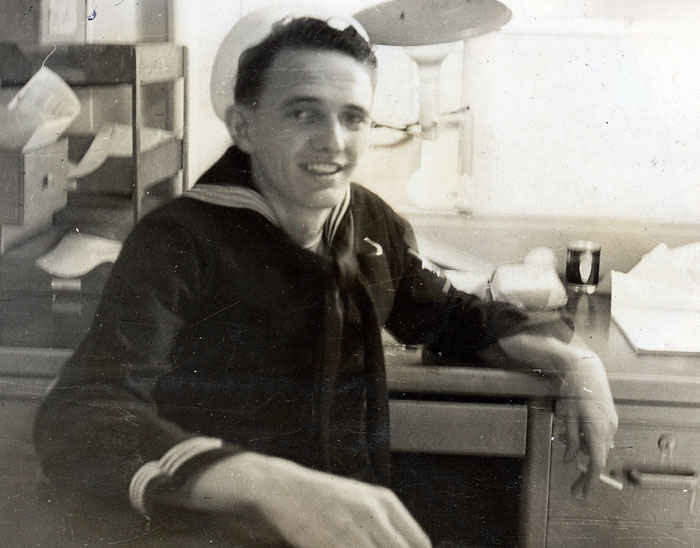 3/1951 My grandfather ate pretty well in the Navy, They made their own ice cream and got a steak, or chicken on Sunday’s because they had a lot of space to hold the food. 1952 After the 13 months, at sea the USS Leo came back to San Francisco for a complete overhaul and went to dry dock for 3 months. My grandfather received a 30 day leave and my grandmother came to San Francisco to live for 3 months before my grandfather had to ship out again. The Leo went up to Seattle and my grandmother followed along with some of the officer’s wives but when the Leo went to Alaska they could not follow. Apparently some Russian planes were landing on an island near Alaska, made of a temporary land strip so after it was torn apart the Leo went up there to haul the airstrip back to the States. 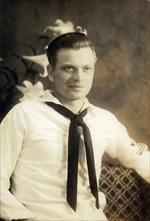 My grandfather was at sea for a total of 21 months. 1952 Great San Francisco fire. My grandfather told my grandmother to take care of the money in San Francisco while he was stationed so my grandmother took real good care of it. Until my grandfather told my grandmother to move it because her hiding spot was not very good, so she did. When it was time for my grandmother to go back home she burned the boxes and the money went up in smoke with them. 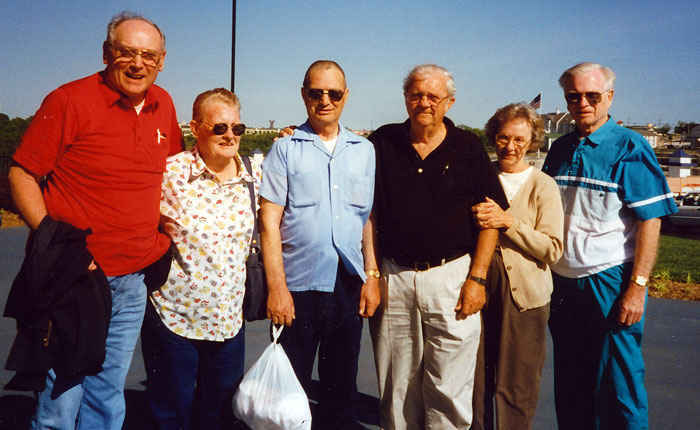 Luckily, a good friend on the ship, Richard Yanni loaned my grandparents the money so my grandmother could go home. Gene Yanni and Darleen Farr were also very nice to my grandmother and always took her around with them. This is a picture coming back from shore to board the Leo. 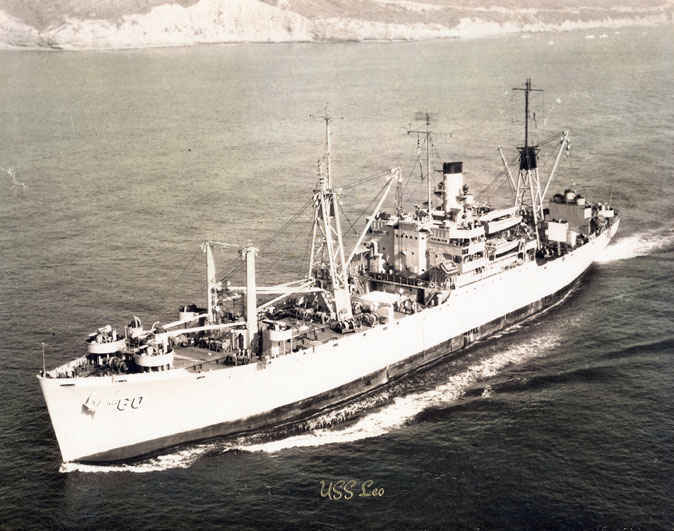 USS Leo received five battle stars for service in Korean War and two battle stars in World War II. The front page of the USS Princeton Aircraft carrier on July 29, 1952. All the large ships at this time created a daily newspaper distributed to the crew. Reactivated with the outbreak of hostilities in Korea fifteen months later, Princeton decommissioned from WWII refreshed, she joined TF 77 off the Korean coast, her planes and pilots making possible the jet combat air patrols over Korea. USS Walke Destroyer. 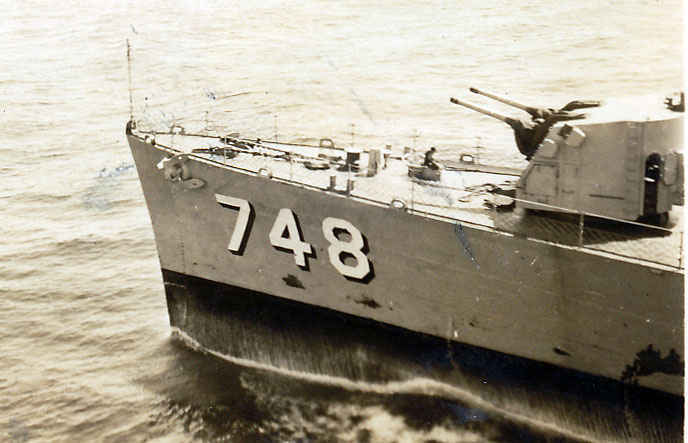 While steaming off the Korean coast with TF 77, Walke struck a floating mine, which severely damaged her hull, killed 26 men, and wounded another 40 sailors. USS St. Paul (Baltimore-class cruiser). Saint Paul earned one battle star for WW II service, eight battle stars for Korean service, and nine battle stars for Vietnam service. USS New Jersey (Iowa-class), among the four completed battleships New Jersey earned the most battle stars for her combat actions, and was the only battleship of the class to have served a tour of duty in Vietnam. USS Missouri is in the far background. Missouri (Iowa-class) is the final battleship to be built by the United States and is notable for being the site of the surrender of Japan at the end of World War II. This is the minesweeper that always trolleys in front of the Leo making sure there were no mines. If a mine was found, the minesweeper would shoot the mine. The Leo she spent 1951 operating between Sasebo, Japan and Korea. Leo operated between Sasebo and various rendezvous points in Japan. Picture of Sasebo, Japan. The tide comes in at night. 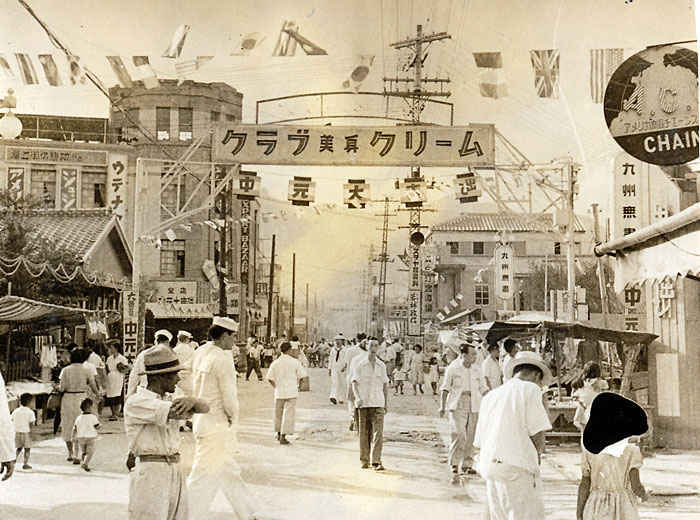 When war broke out in Korea Sasebo became the main launching point for the United Nations and the U.S. Forces. 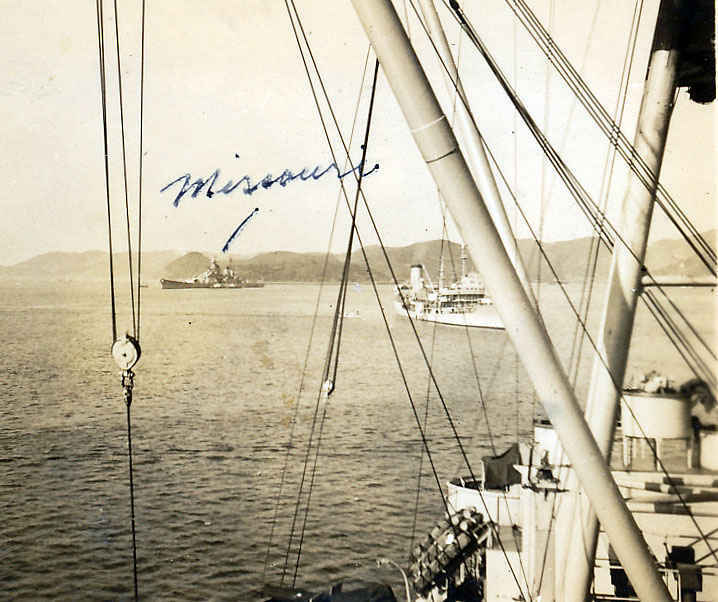 Millions of tons of supplies flowed through Sasebo on their way to Korea. The number of Americans in Sasebo grew overnight and some 100 warships and freighters came through per day. How would you like to get this in the mail? 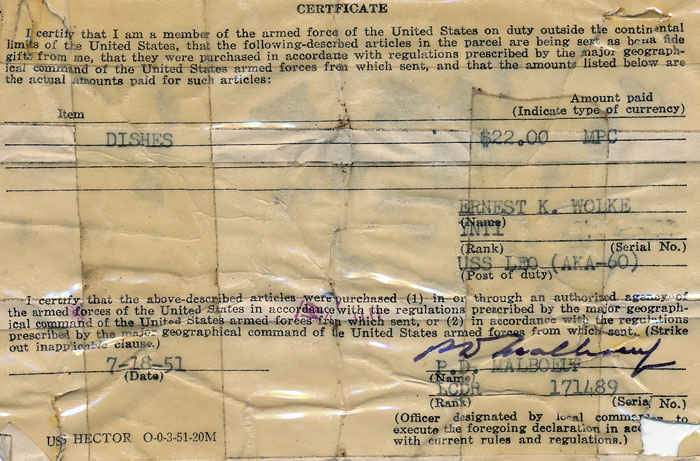 My grandfather had already served in the Army during World War II and only joined the Navy reserve during peacetime because he was recruited heavily for his accounting skills, which paid him a lot for the time. 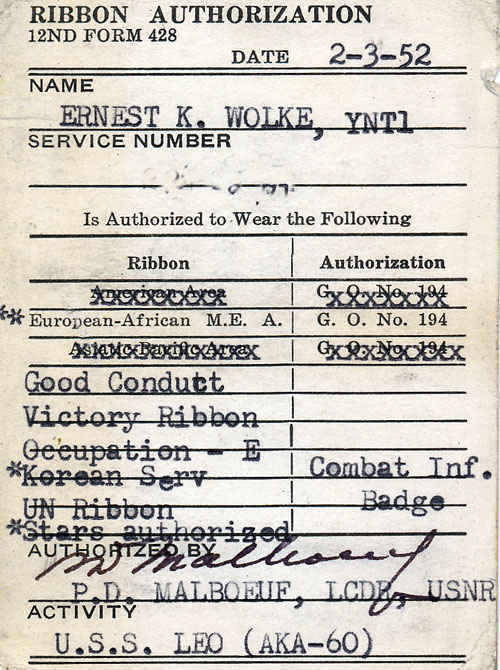 He had no idea what he was in for when the Korean War broke out and he received this in the mail. USS Leo first assignment in World War II was for the assault on Iwo Jima with Amphibious TF 51. After the assualt she evacuated casualties. 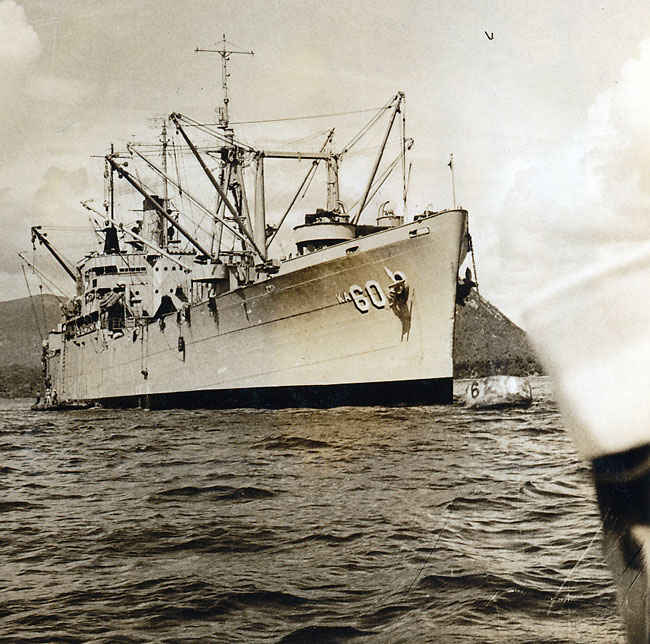 USS Leo (AKA-60), an Andromeda-class attack cargo ship, was named for the constellation Leo. 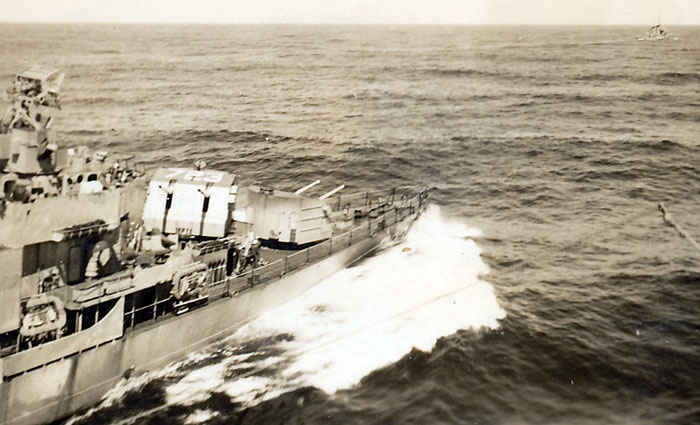 USS Leo served as a commissioned ship for over a decade. Leo is the only ship of the United States Navy to hold this name. 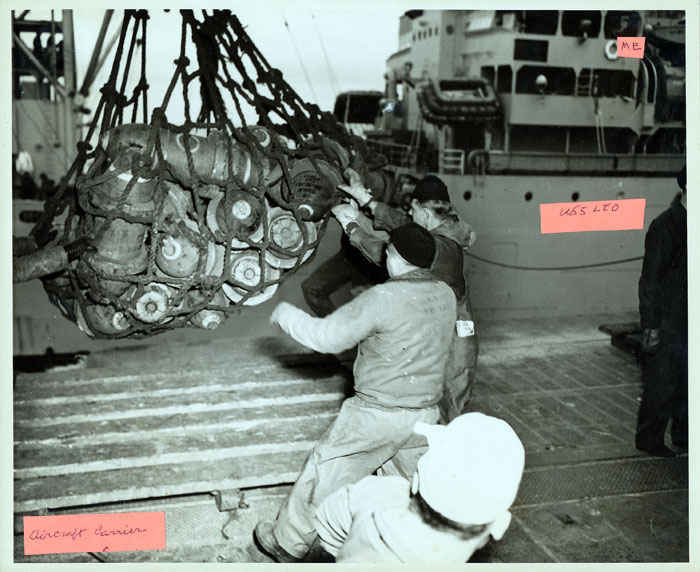 Loading bombs from the USS Leo to an Aircraft carrier. 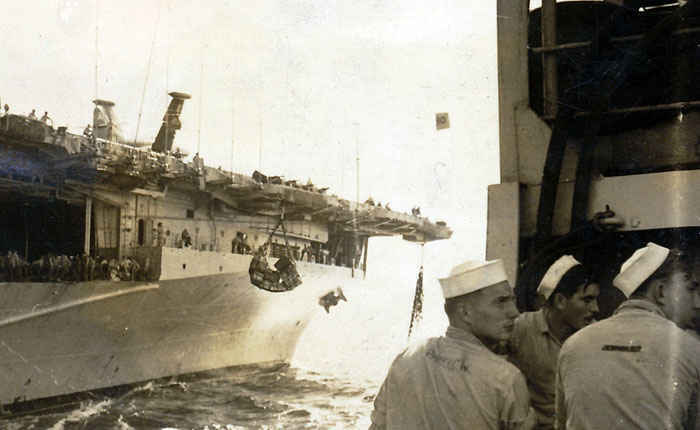 The men are standing on the Aircraft carrier and the USS Leo is in the background. 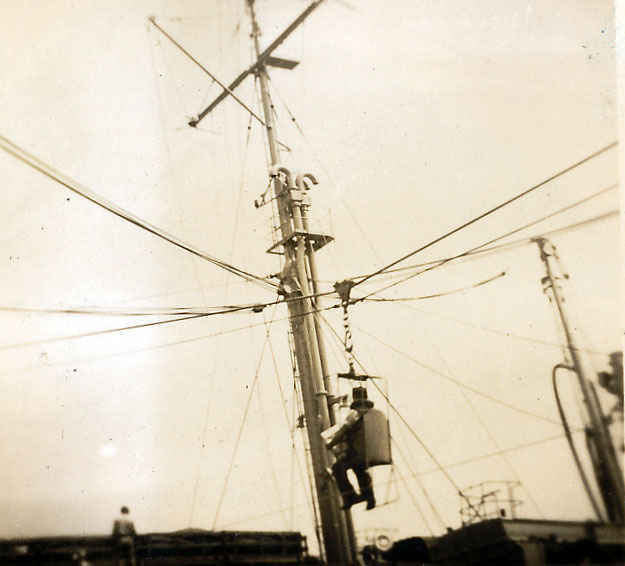 If you look to the top left, you will see where my grandfather spent most of his time on the radio while ammunition was being loaded onto ships. 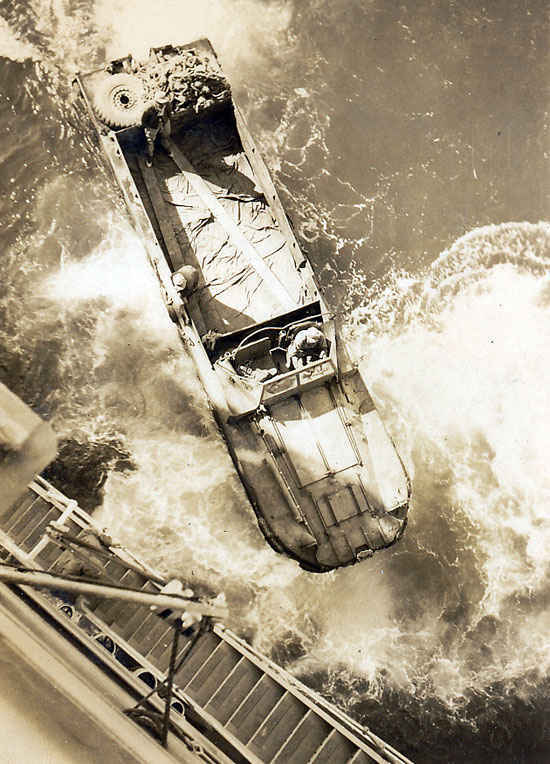 This is a picture of a Army duck boat coming alongside the USS Leo. I thought it was amazing that a duck boat would come out to a large ship like the Leo. If you ever get a change to go to Boston, you need to take a ride on the Duck boat, the company has authentic World War II duck boats like the one seen in this picture. 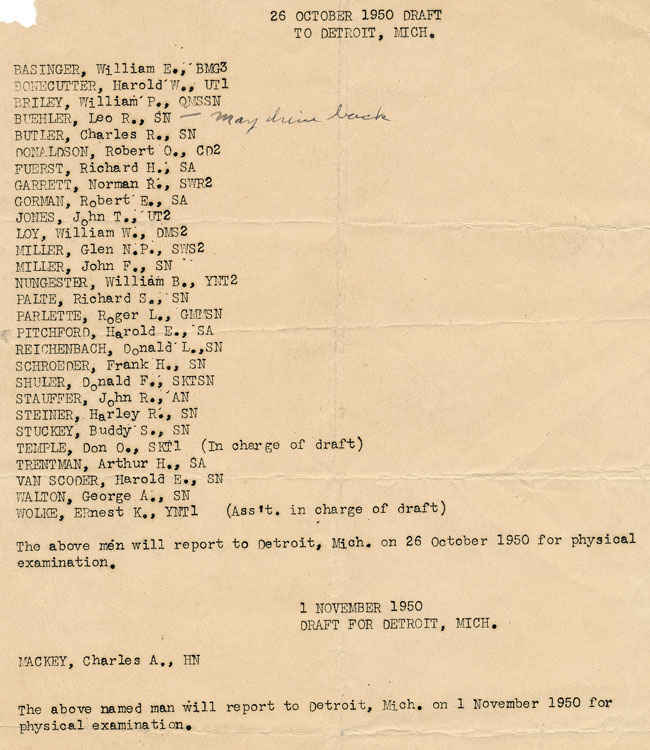 Draft roster from October 26, 1950. On the day my grandfather had to report to active duty there was a huge snow storm and he almost did not make the train from Lima to Detroit. Not reporting means one goes to jail but apparently the people who did not report never had to go Korea. To the left Bailey, Monroe, Kelly, my grandfather. 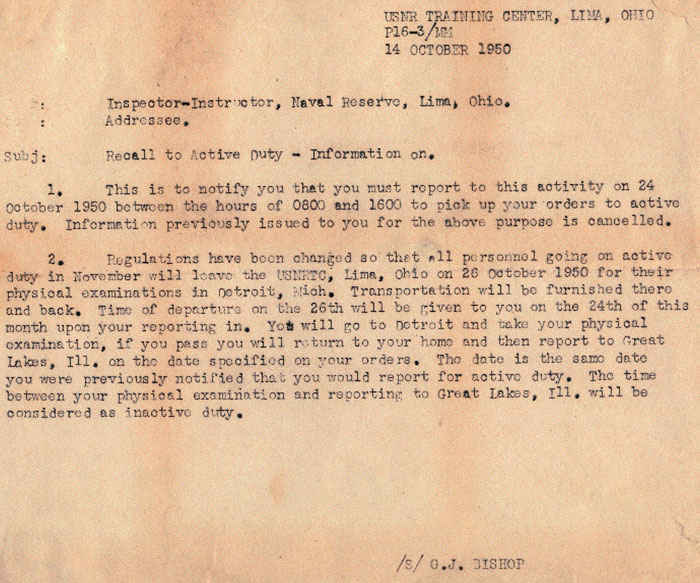 October 14, 1950 active duty notification. Boyer at my grandfather's desk. Sasebo, Ginza Japan on market street. 1952 back from San Francisco and Korea, in Chicago on the way home to Ohio. Earl Kelly on the Bridge phone. Earl Kelly to the left, grandfather to the right. 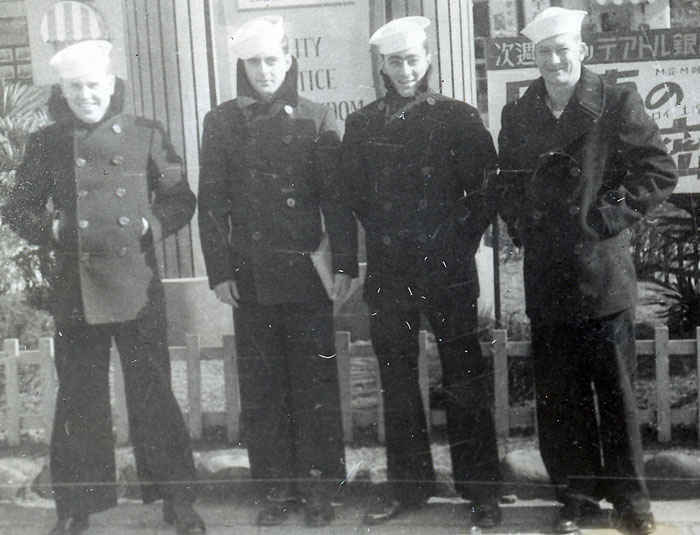 (Rusty is the little guy at the bottom) Earl taught my grandfather everything he needed to know in the Navy and were best friends. You see, my grandfather joined the Navy for a job and the agreement was that we would get the same rank as he had in the Army (Technical Sergeant) which equals a Third Class Petty Office in the Navy. My grandfather never had any training for the Navy and when the Korean War broke out they sent him straight to active duty. Luckily, for my grandfather Earl Kelly was a great guy and taught my grandfather everything he needed to know which Earl did not have to do since he was a First Class Petty Officer (lower rank). Earl ended up making a career in the Navy and spent many years in a submarine. Picture of the Leo in the docks of Sasebo, Japan. 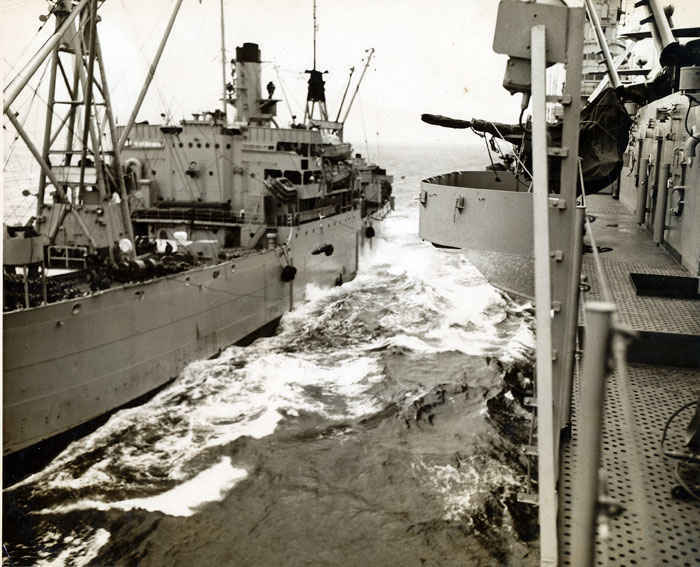 The Leo and her sister ships practiced night underway replenishment techniques that helped resolve logistical problems. 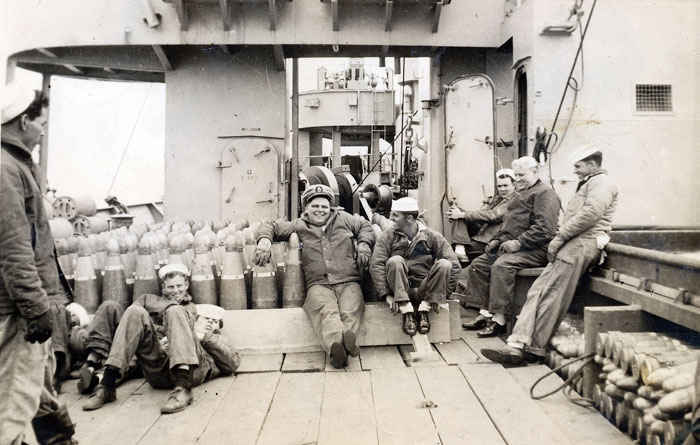 In this picture, you can see my grandfather on the bridge, the bombs that are about to be loaded onto a carrier and then the phone lines connecting both ships. Imagine a time before email, phones, or computers. 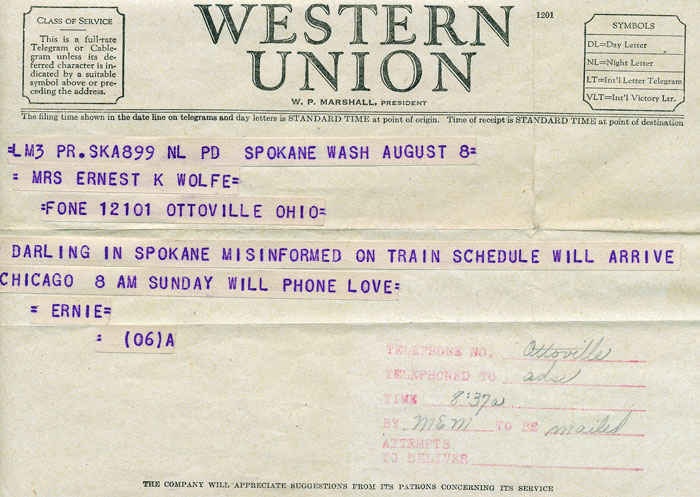 Western Union was the way to communicate and this is was state of the art during its day. This a message my grandfather sent to my grandmother. This a picture of gun powder aboard the Leo. This is only part of the load. 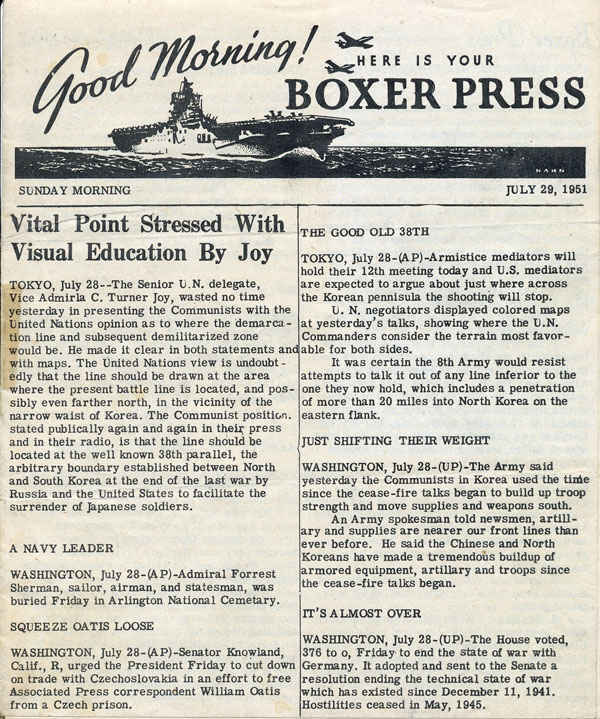 Here is the front of a Korean War Navy review. 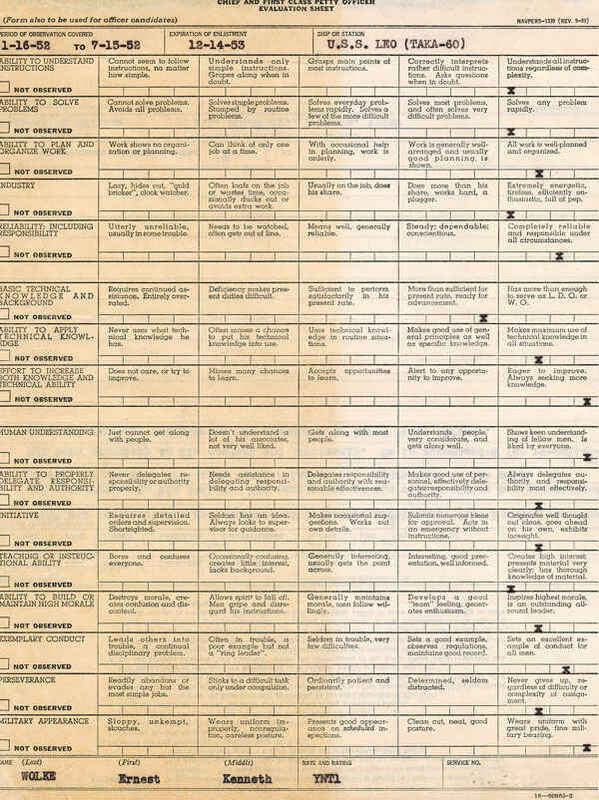 Notice that my grandfather received perfect ratings in all categories except for knowledge and this is understandable since he never received a day of training before he went on active duty. Keep reading to find that story. I think this is one of the coolest items I have from my grandfather. This is performance review conducted by his commanding officer, Captain Nolan. This is how a service man would send back items they received while on active duty. We still have the dishes sent back from Japan. On the bridge talking on the phone. My grandfather spent much of his day here. To the left Donnel, Armstrong, Lewis, Chopp. On the desk of the USS Leo during the Korean War. Loading ammunition to the USS Boxer. This how sailors would be transferred from ship to ship or ship to dock at different points in time. 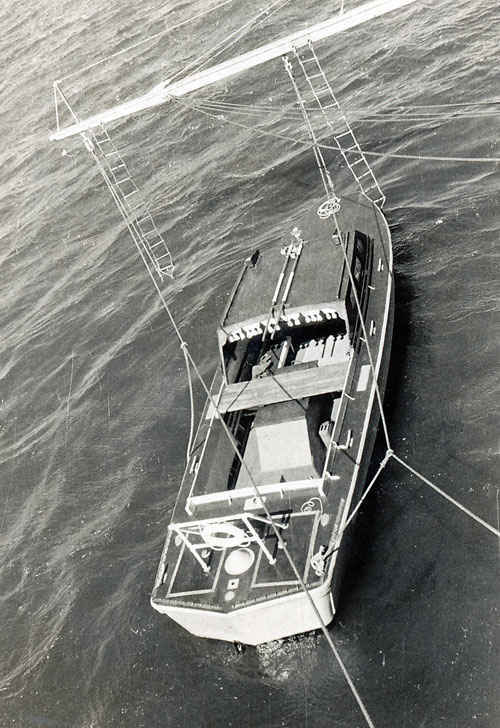 A smaller boat be lifted out of the Leo and put in the water then could dock aside her and allow for the transport of sailors. 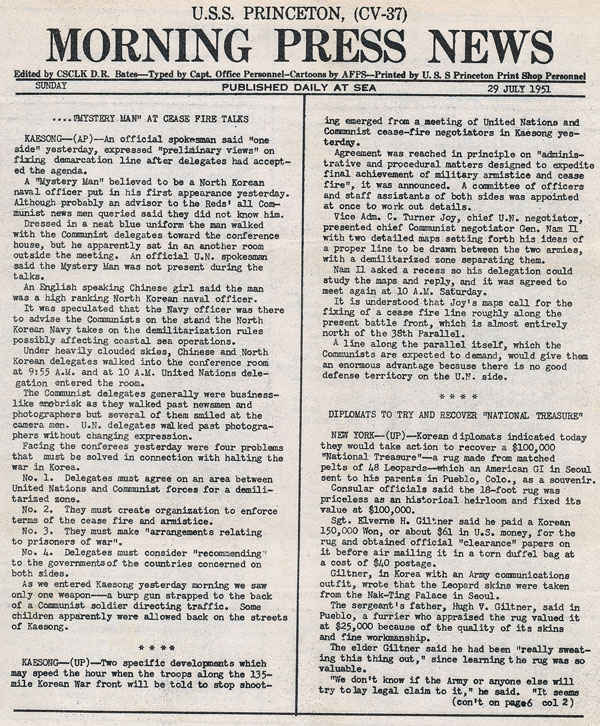 Daily newspaper from July 29, 1951 that my grandfather got in Sasebo, Japan. With the outbreak of the Korean War, she was pressed into service to carry planes to the fighting. 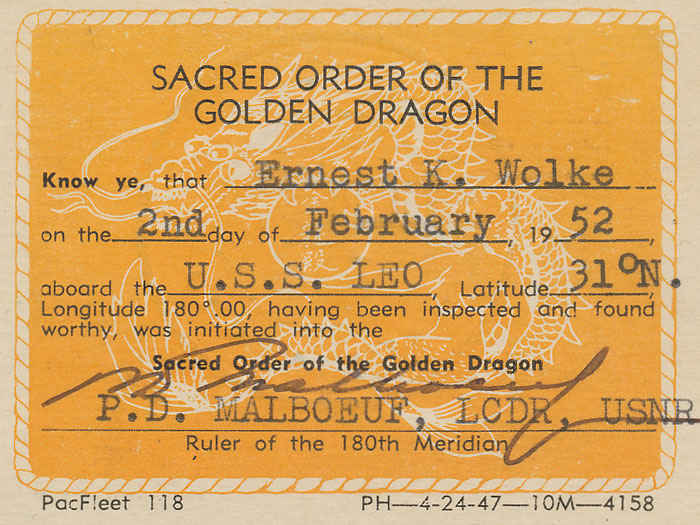 Sacred order of the Golden Dragon. This was given to everyone whenever they passed the 31 degree Latitude north. 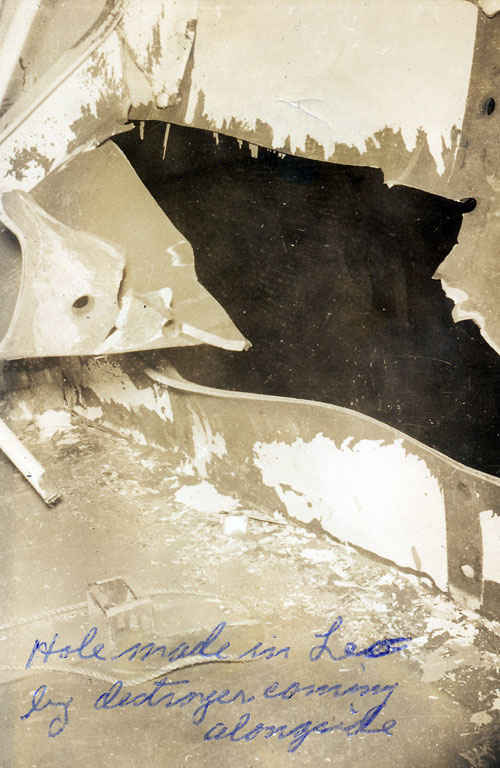 Damage to the USS Leo when a destroyer ran into her. 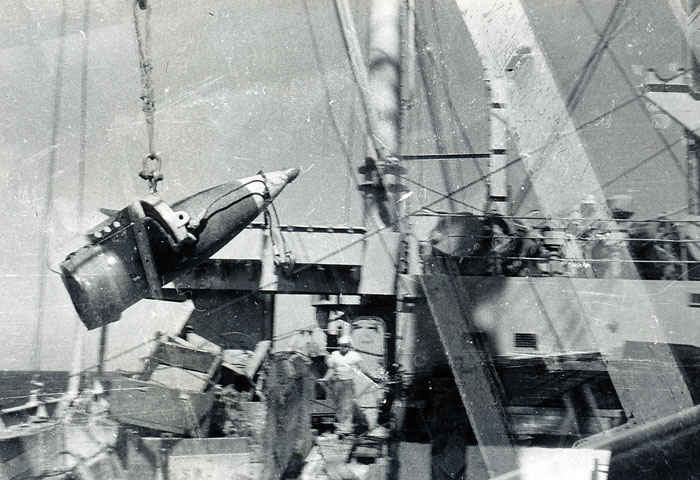 Loading a 16-inch shell for a battleship. Look at the man standing to the right and compare him to the size of this shell. Imagine one of these being fired from a gun, wow. 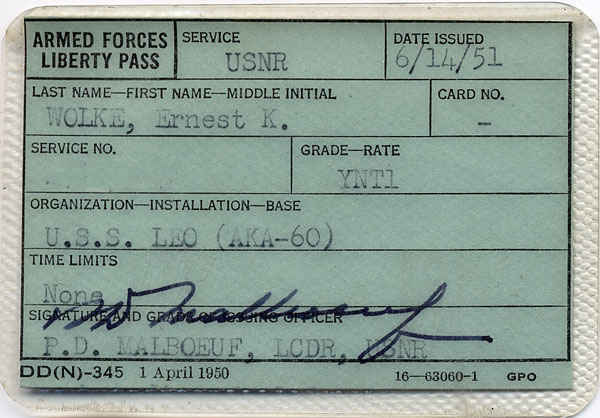 Here is an authentic Armed Forces Liberty pass. One better not get caught off the ship without one of these in their pockets. Since my grandfather was in the Army and received ribbons, it is actually possible to wear his Army medals on his Navy uniform. I think this is pretty amazing as I do not know of another person who has served in more than one branch. 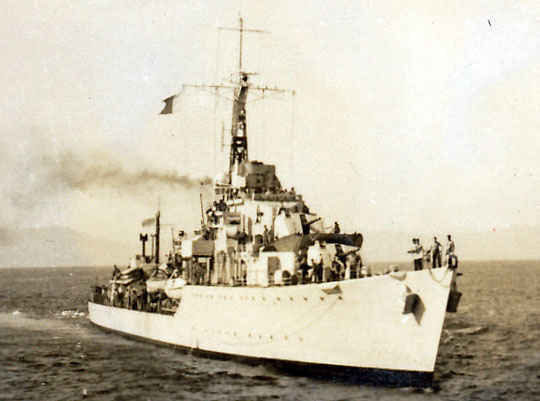 One of the numerous ships that my grandfather saw as he was on duty. 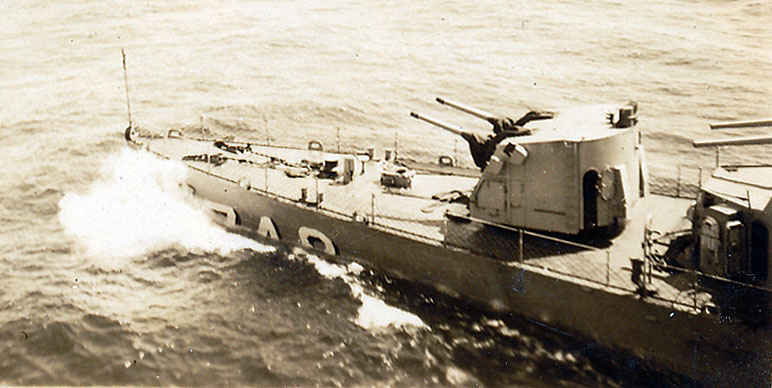 This is the British HMS Cossach. This is a picture of my grandfather and grandmother shortly before leaving to go to Detroit then Chicago, then San Francisco, then Korea. I think this is one of the coolest pictures. 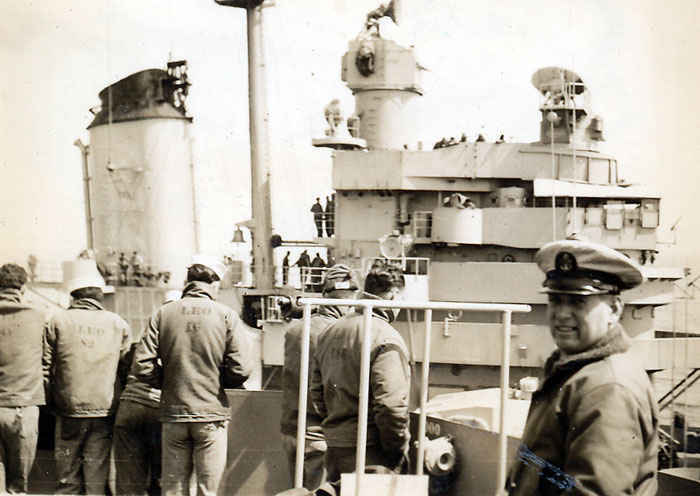 Look in the middle of the picture front, it is the captain, then look 2 people behind him, that is my grandfather. He followed the captain around everywhere and he was not kidding. Loading ships full of ammunition at sea was never, a routine task as one can see in this picture, a disaster could happen at anytime via a rogue wave, wind or complacency. 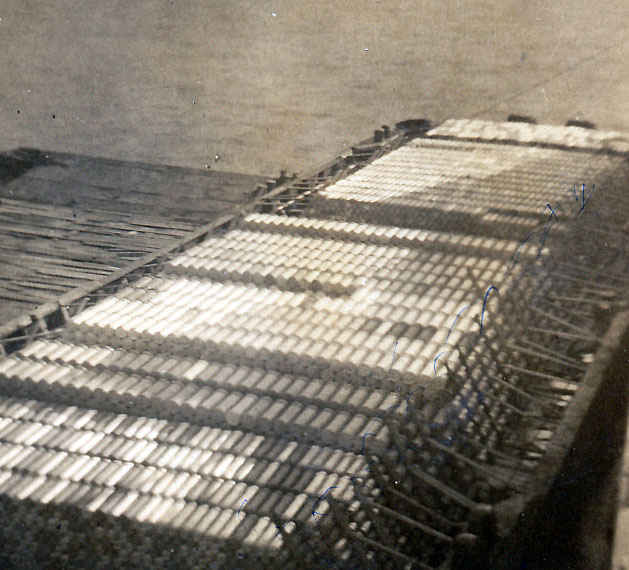 In order to transfer ammunition at sea, a line would be shot across one ship to the other then large cables would be attached for the transfer. At times even a man would be transferred at sea. 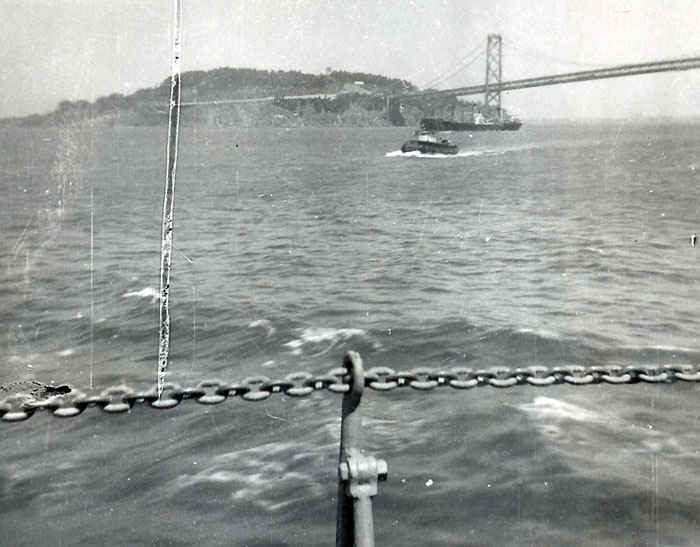 USS Leo going under the Golden Gate bridge to serve in the Korean War. 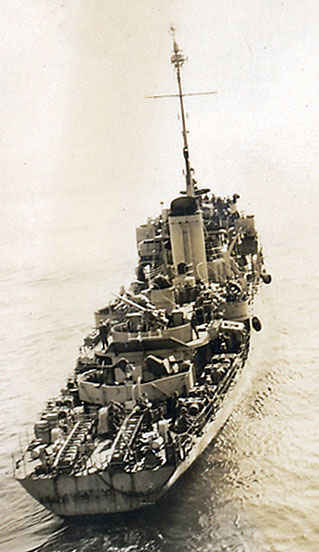 Here is a classic sailor term "taking a dip", as seen in this picture the Destroyer's bow is going way into the water. Here is a classic sailor term "coming from a dip", as seen in this picture the Destroyer's bow is coming way out of the water.